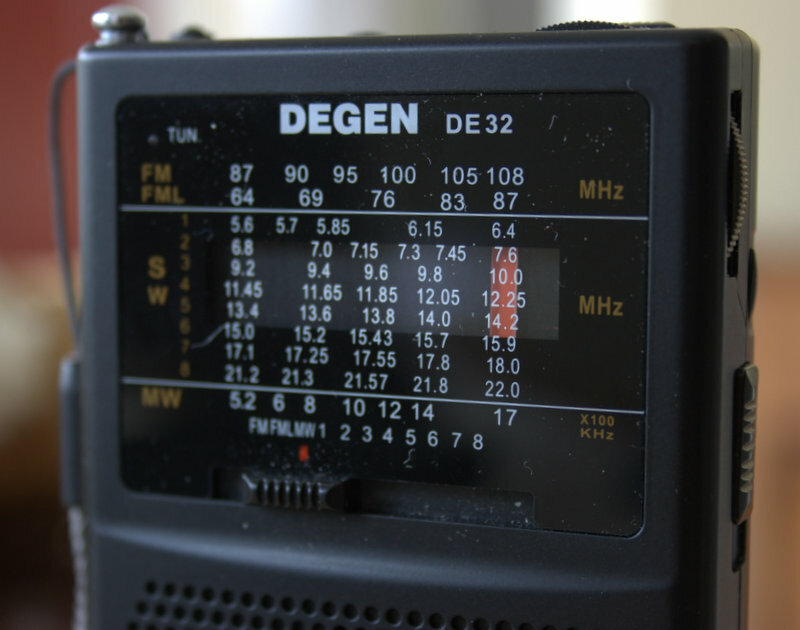 The Degen DE32 is one of the latest DSP-based analog radios to hit the market. In the past, I have reviewed two others: the Degen DE321 and the Kchibo KK-9803. Tecsun had announced a version of their own–the Tecsun R-2010–which I had eagerly anticipated, but I now believe it’s been dropped from their future offerings. 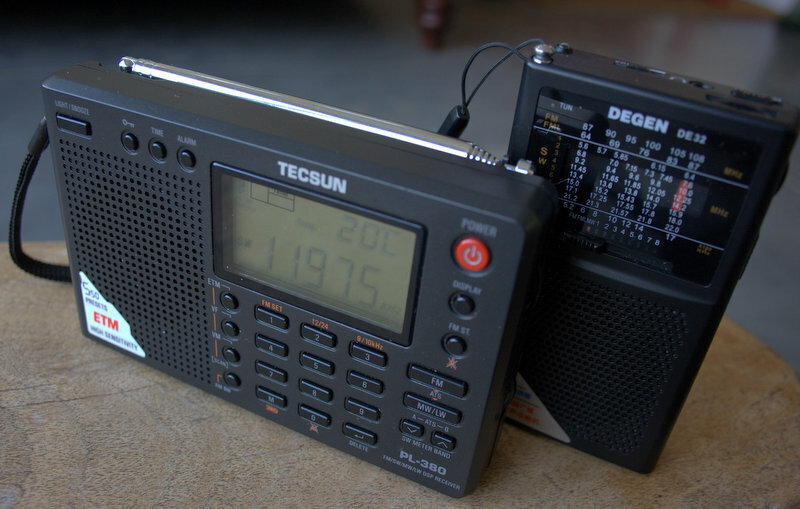 [Update: Not true–the Tecsun has been released as the R-2010D, see review]. I purchased my Degen DE32 from this China-based seller on eBay . To my knowledge, eBay is the only place the DE32 can be purchased, at time of posting. As with the other radios mentioned above, my expectations were quite low for this little radio. After all, at $27 US (shipped), you can’t expect top-notch performance characteristics. 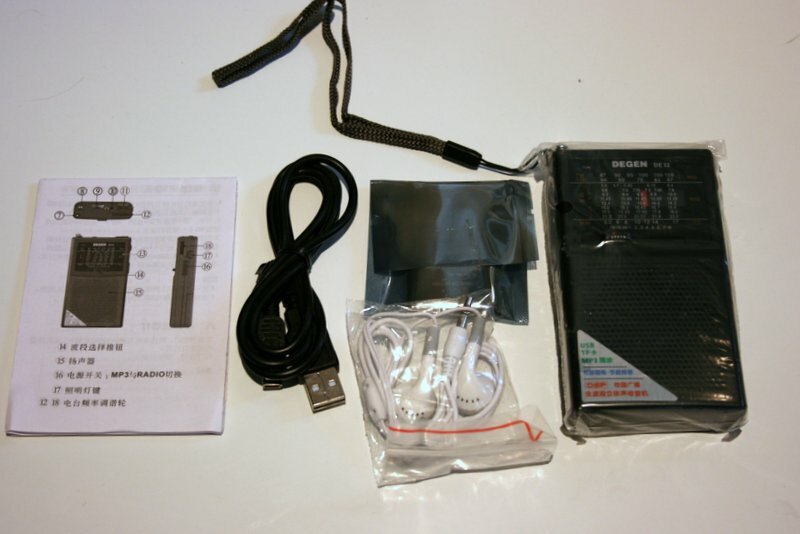 The DE32 comes with a carry strap, USB cable, a carry pouch, slim rechargeable battery, and operating instructions in Chinese. It does not come with a USB wall adapter (you’ll have to plug it into a USB port on your PC or other USB wall charger) and it does not come with a Micro SD card (for digital audio playback). 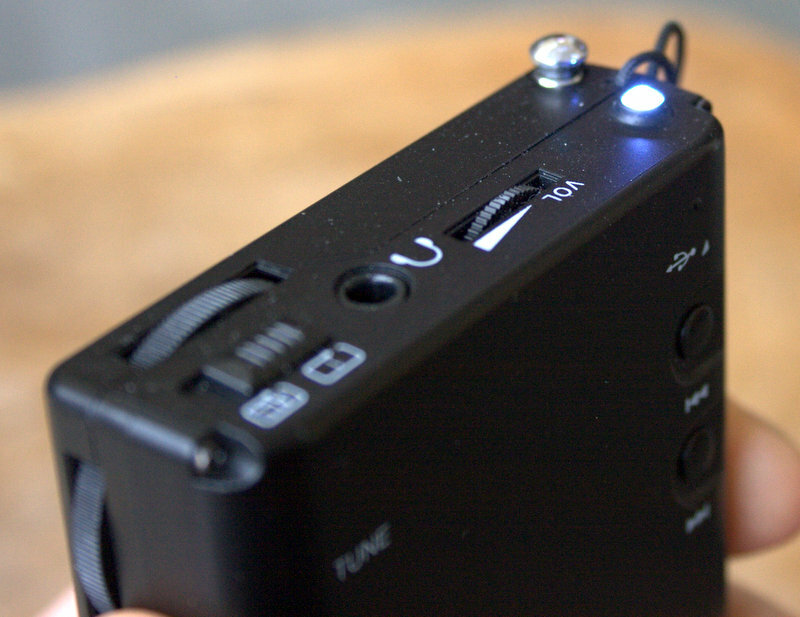 The DE32 has a small built-in speaker. The sound is a bit tinny, but is actually better than I expected from a speaker of this size. It makes for comfortable listening at close range–especially of spoken-word broadcasts. Happily, plugging in a good set of earphones helps audio fidelity tremendously. This is the only way I would listen to music on the DE32 for an extended period of time. On FM, in fact, audio via earphones is surprisingly good (again, for a $27 radio–check out the audio sample below). The DE32 covers three radio bands: medium wave (AM), FM and shortwave (5.6-22 MHz). Performance between bands varies greatly. The best band, by far, is FM. Again, no surprise here, as the DE321 and KK-9803 performed quite well on FM. From my home, I can pick up my benchmark distant NPR station quite easily if I hold the radio in my hand. If I place the radio in a window sill, its performance degrades somewhat and contains more static as the extra grounding (from holding the radio) made a positive difference. The audio, though, is still perfectly intelligible. Local FM stations come in quite clear and fidelity (through headphones) is excellent. I found that strong local medium wave (AM) stations sound quite good on the DE32–better than its cousin, the DE321, by a small margin. While traveling over the holidays in December, I recorded extended samples of local station (630AM WAIZ) with both the DE32 and the DE321. You can listen to audio samples below, but first it’s important to note that I recorded these (and the FM sample above) with my Zoom H2N digital audio recorder, with radios at a comparable volume and via an audio patch cord. Note that these recordings represent what each radio sounds like via headphones, not their internal speakers. You’ll note that the DE32 sounds a little fuller than the DE321, but reception is nearly identical on this local strong medium wave (AM) station. I also found that the DE32 was quite effective at nulling out local RFI (electrical noises) on medium wave. At the beginning of the recordings, above, you’ll hear the static increase and fade as I null out the noise by turning the body of the radio. The DE321 couldn’t null out the local noise quite as effectively as the DE32. 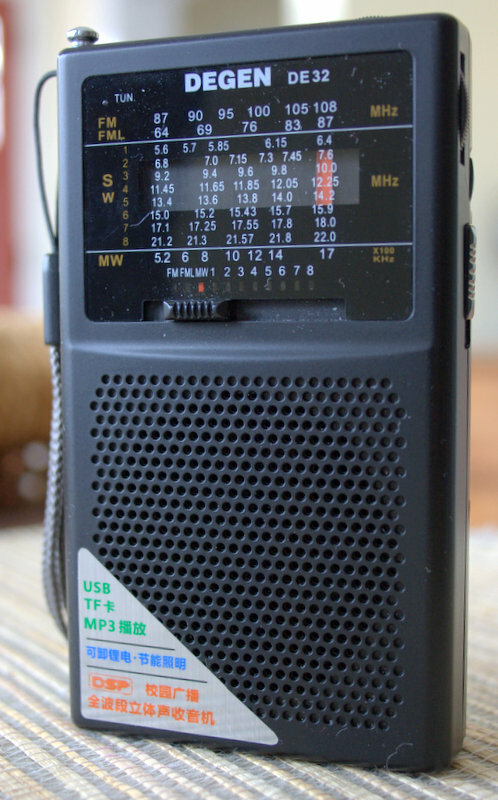 For medium wave DXing, though, you’re better off finding a different ultralight radio. The AGC simply can’t handle marginal signals. Indeed, the same AGC problems plague the shortwave bands as well. DXing would be very unpleasant as the AGC circuit simply can’t cope with weak signals or fading. All in all, as with medium wave, shortwave radio reception is fine for most strong signals. There’s no comparison, really. In other words, you can hear it. The PL-380 has a lower noise floor, a fuller sound and no AGC problems as with the DE32 and DE321. Hence the reason I always take the PL-380 while travelling–and as a back-up if I plan to record a broadcast on-the-go. Not too bad, really. Keep in mind, though, that in my part of North America, Radio Havana broadcasts are so strong that I can pick them up without even extending the whip antenna on most portables. I haven’t tested the digital audio playback on the DE32 yet, although I expect the audio to be pleasant enough. Of course, it lacks a display to show any information about the audio you’re playing, but it would be great to load a few podcasts or audio books on. Conclusion? Though slim, lightweight and inexpensive, I wouldn’t find the DE32 DSP radio/digital audio player a useful radio in my collection. If I were you, would I buy it? If you’re looking for a very inexpensive MP3/Digital Audio player with AM/FM and shortwave, and your expectations are fairly low, the Degen DE32 is a reasonable $27 piece of kit. Especially if you only plan to use the FM band. 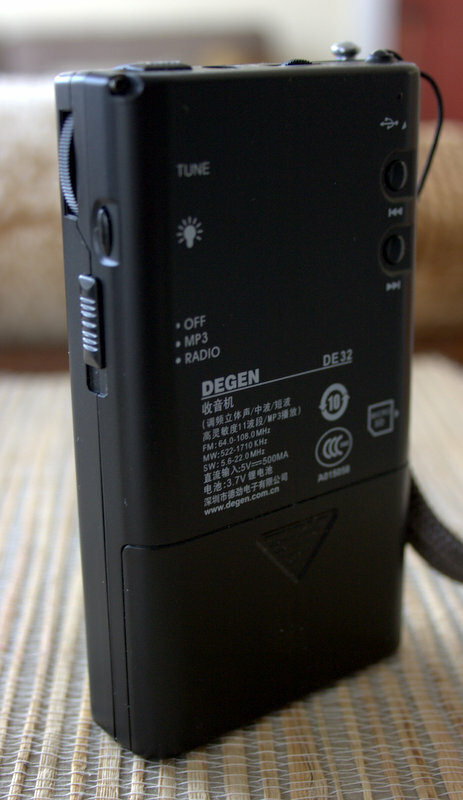 If the digital audio playback abilities are not important to you, I would go with the cheaper ($18 US) Degen DE321. 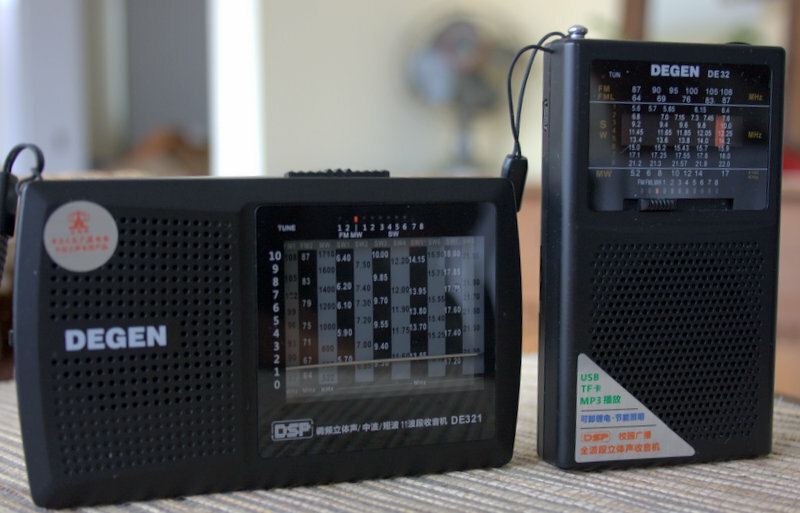 But if you really want performance on medium wave and shortwave, and you could care less about digital audio playback, spend the extra $23 ($50 total) and buy the Tecsun PL-380 , instead. As you can hear above, it’s a much, much better receiver. 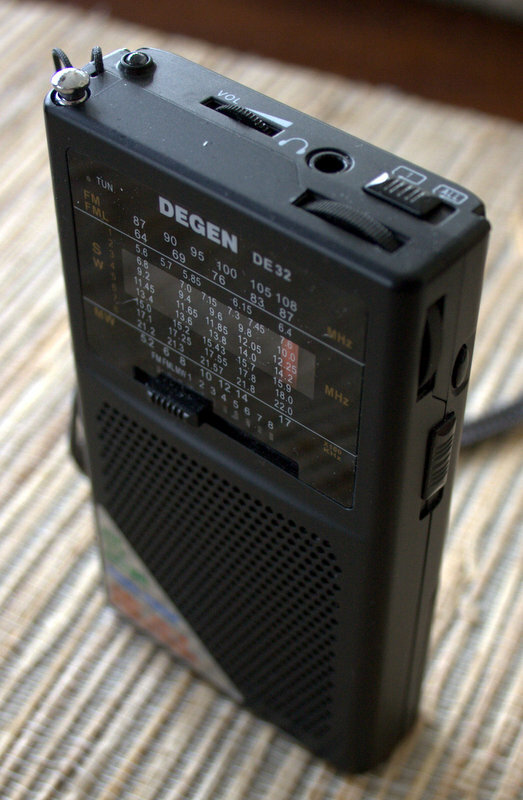 This entry was posted in Articles, Manufacturers, Mediumwave, New Products, News, Radios, Recordings, Reviews, Shortwave Radio and tagged DE32, Degen, Degen DE32, Degen DE32 review, Degen DE321, Tecsun PL-380 on February 17, 2013 by Thomas. A family member bought this (Degen DE32) for me as a gift. The instructions are in Chinese, but I do not know how to that read Chinese, unfortunately. So, I’m hoping that someone here can help me with some (hopefully) simple questions. I’m not sure how to upload an Mp3 onto this player. I tried plugging it into a computer port. It lit up, but it didn’t show up as a device when I attempted to upload an Mp3. Do I need a Micro SD card to do that? Once you upload a few Mp3 recordings, is there a way to go to a specific one, or to control the order? Also: what are the two round rolling buttons on the back of the unit? Help! I don’t have the DE32 in front of me right now. I think the way I’ve always loaded MP3s on the DE32 is by dumping files directly on a microSD card with my computer. I don’t think you can add them by USB cable; I’ll have to check when I’m back home. Hopefully someone else can chime in with answers to your other questions. Yes, right at the connection to the PC receiver will only charge the battery, you need to download music to a memory card separately.